It was a gray, misty day which only made the fields look more green, as if that were even possible here. The air had a faint sweetness of spring blooms, and often the only sound to be heard was the click-clack of pedals turning vintage chains. Though there were near 200 people pedaling down a back country road, they all were in a peaceful moment of remembrance and appreciation for a slower, quieter time. On a backroad to Dunderry Ireland. One thing synonymous with Irish nostalgia is the High Nelly bicycle. Since the turn of the 20th century the bicycle was a part of everyday life, a necessary and welcomed mode of transport for a country lacking in motorized vehicles. Though this single gear bicycle of black steel frame and comfy leathered spring saddle is iconic, what makes it special are the memories attached to and made from it’s role in Irish life; from tradesmen making house calls, to farmers checking fields, mothers needing supplies from town, to young couples on a romantic ride. 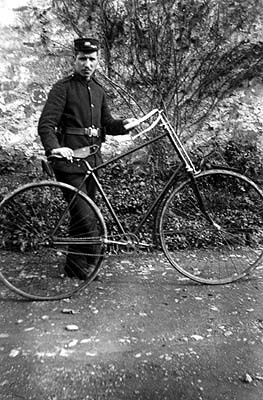 The issue of High Nelly bicycles to Irish Garda (police) and Army during WWII greatly improved their roles within the vast rural communities and many a dispatch to IRA members during the fight for independence were made upon a High Nelly. Even in these modern times, throughout large and small cities across Ireland the postman delivers the mail on a bright yellow High Nelly bike. The stories and memories with this legendary bicycle are endless. And though nearly every shed or barn can be found hiding an old High Nelly in some stage of aging or decay, you’ll be hard pressed to find an Irishman to let one go. There are numerous High Nelly Clubs across Ireland. Part social club part appreciation society, these clubs rally on occasion for the sake of community and a usual purpose of charity. 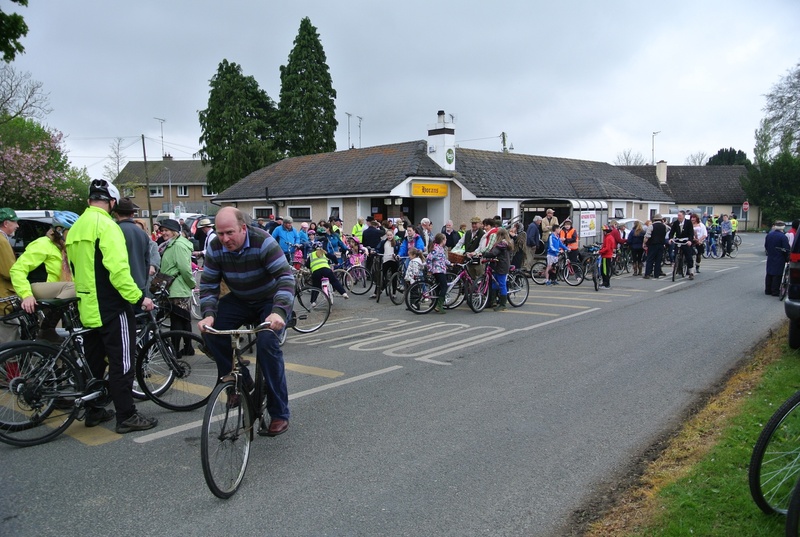 Often much more than just a bike ride, clubs will organize special highlights along the route featuring historic and entertaining bits and gather at the village pub after. when the streets are filled with music and lined with old craftsmen working away, farmers selling chickens and showing off their best stock, gypsy wagons with fortunes being told and even the town match-maker taking names and making introductions. From the moment we arrived we were welcomed into the fold and never fell short of a smile or chitchat. Locals pedaled from the homes down the way and neighboring communities arrived pulling livestock trailers filled with High Nelly bicycles for members to Ride. 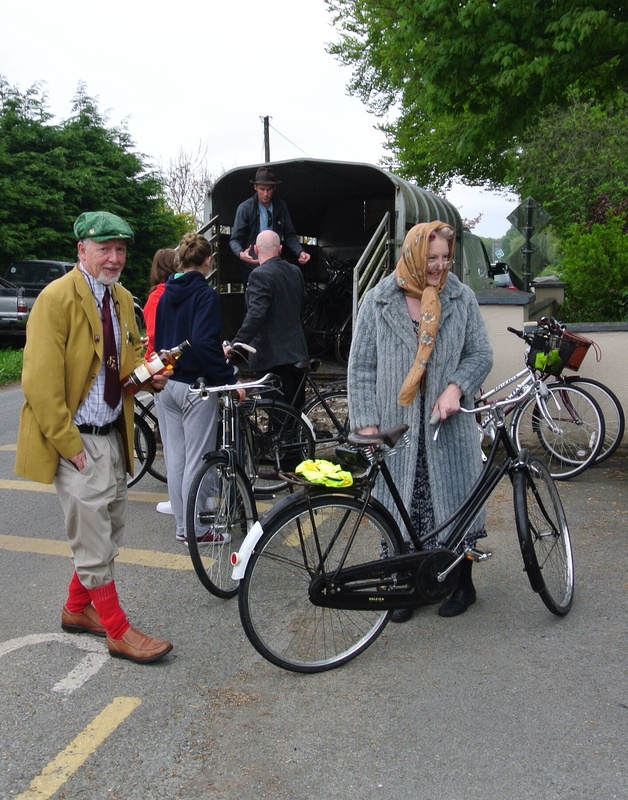 The rider demographic was vast, spanning from wee little ones in back seats, to herds of teen boys, to happy couples on tandem bikes, to bachelor farmers in wellies, to elders in their 70s and 80s. The ten mile back road ride was full of surprises. The first stop was at a crossroads where stood a 300 year old blacksmith forge on one corner. This forge like many of its day made an important contribution for the Rebellion of 1798 producing pikes for the Wexford soldiers as they traveled through the area. 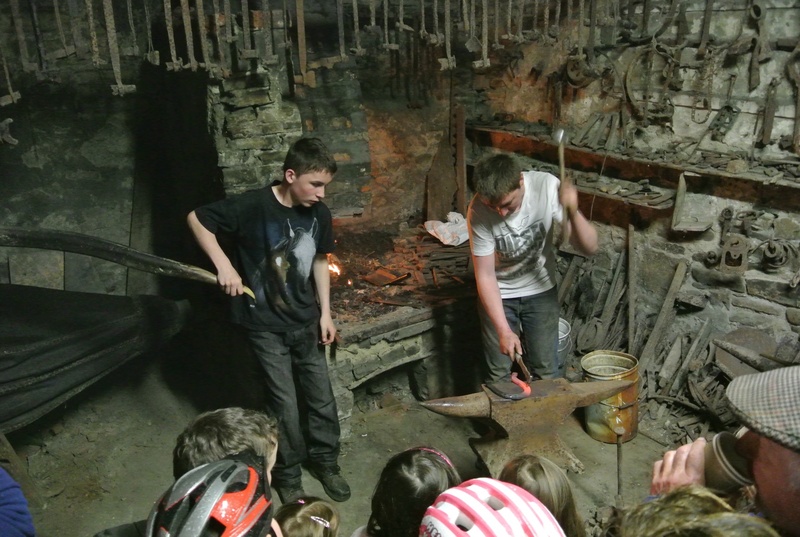 Here among centuries old bits of days gone by, two young men exhibited smithing skills for us all to view. Outside the Garda (police) waved through the few cars that did come along, while the road was full of activities; ladies had hot tea and brown bread with jam waiting for riders, costumed contestants proudly paraded through the mix, kids visited with mickey mouse and petted the pony, and even some fine irish country dancing from the little girls of Dunderry. Irish country dancing at the crossroads, just like the old days some said. After about an hour of visiting it was back on the bikes to the 2nd stop at the monument for the Wexford soldiers of the 1798 Rebellion for a short history talk. A unified Ireland (protestant and catholic) fighting for independence from Britain, many of the soldiers who had been marching towards Antrim and Co. Down, died and were buried in the fields of this area, some from exhaustion some from being captured. Legend tells you could always tell where a Wexford man was buried as corn would sprout the next year from his grave site (soldiers were known to carry seeds in their pockets to chew on). 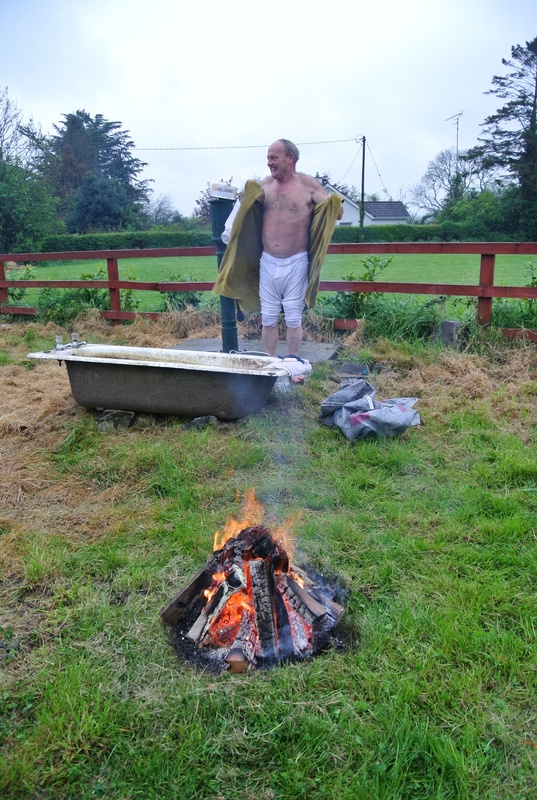 The last stop off along the route was a true comical treat as riders approached this crossroads they were greeted by a ‘tinker’ bathing roadside at the well in an old tub of campfire heated water while his family of gypsies sat on their wagon step playing a tune. It was a brilliant moment and the poor guy had to be freezing! 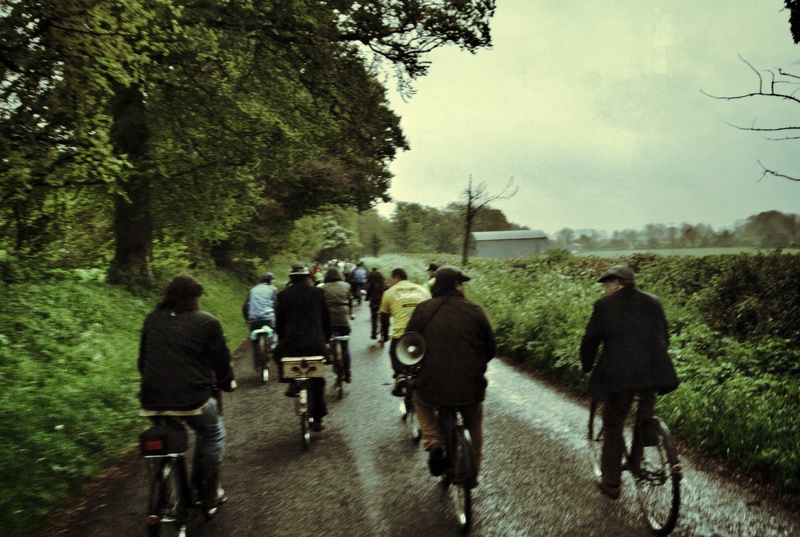 Though the misting rain kept on no ones spirits were dampened, as riders warmed themselves pedaling away the time chatting with one another and enjoying the serene vistas. It truely felt as if nothing else existed and I can recall a few moments of warm chills that filled me as if i needed to pinch myself – however a High Nelly bike requires both hands on the handle bars at all times for a novice H.N. Rider like myself. 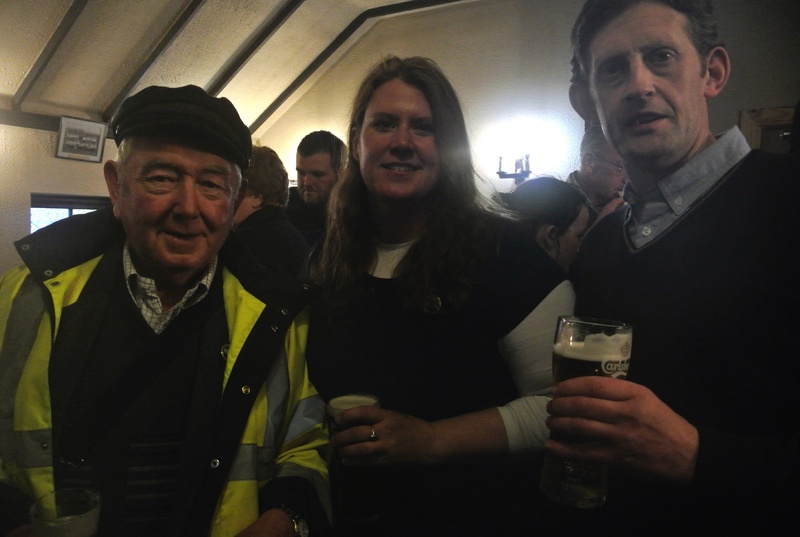 We finished off the evening with a few pints at Horan’s Pub enjoying the locals and all their hospitality. Between rider registration (5€) and raffle tickets we guesstimated over 1000€ had been raised for the Dunderry Senior Citizen Charity. 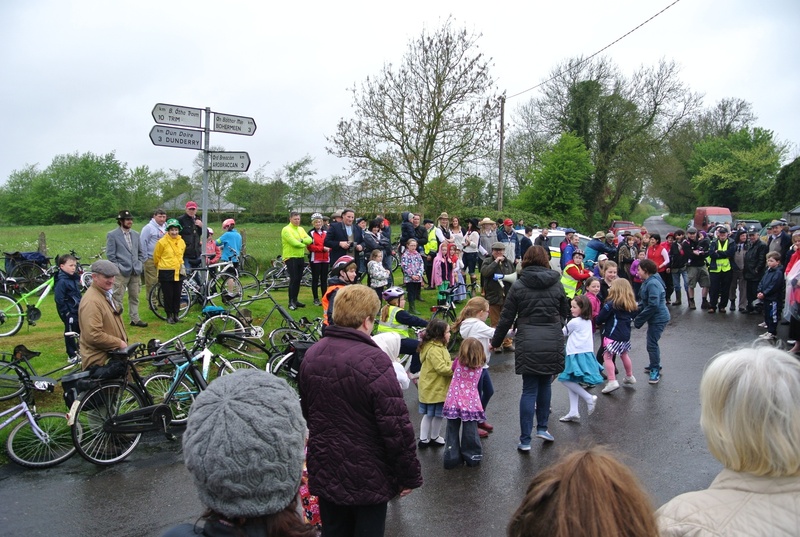 If you are anywhere near Ireland next year, first saturday in May, you must make it a point to find your way to Dunderry Ireland and take part in pedaling through the past. Awe… A day you both should have definitely been here for!! You two would of had a blast!! Next year this should be an Extreme-Labadie Road Trip destination! I love the one with the red wagon and violin players. What a fun day! Yes, we would have loved to be part of that! Hi we are a high nelly club in bagenalstown that we are holding a charity 18k cycle for asd autism spectrum disorder on the 20th july and we are hoping to get as many high nelly groups to come and support a great cause. All our details will be on face book . Hi! Great fun for a great cause – hope you have spectacular day and wish i could make it. I’ll definitely spread the word! 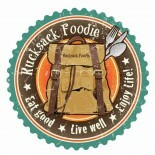 This entry was posted on May 5, 2014 by Rucksack Foodie in Extracurricular, History, Ireland, Traditions, Travel and tagged Dunderry High Nelly Club, Dunderry Ireland, high nelly bikes, Horans Pub Dunderry, Irish traditions, The Rucksack Foodie, Vintage bicycles.